Some times when you read a new author, you just know that you are going to enjoy their books because you enjoy their voice! Tansy Rayner Roberts is one of those authors. She is a new author to me this year. I first read her story Relentless Adaptations in the Sprawl anthology, and then she guest posted for me, and finally, on the strength of loving this short story collection I have also now purchased the first book in her Creature Court trilogy, Power and the Glory. Before I talk any more about this particular collection, I wanted to talk about the series that this is part of. I was going to wait for this book to come out in ebook before ordering but then I saw that the cover was purple and had to have a physical book! And seeing as I was getting this one, I also ordered Nightsiders by Sue Isle (which I have read and enjoyed) and then upcoming release by Lucy Sussex which is titled Thief of Time. Other authors who are going to be included in the series include Margo Lanagan, Rosaleen Love, Deborah Biancotti, Kaaron Warren, Cat Sparks, Kirstyn McDermott, Narrelle M Harris, Thoraiya Dyer and Stephanie Campisi. The vast majority are new to me authors so not only will I get some good spec fic short stories, but I will also be fulfilling my personal challenge to read more Australian authors. Anyway, that's enough about the series. What about this book? I mentioned above that Tansy Rayner Roberts voice really works for me, and that is really embodied in my reaction to this book. Roberts has taken her love of spec fic and of Roman history and combined them with the paranormal to come up with something that is totally unique (or at least I haven't read anything like it) and so much fun! And I must give a huge congrats to whoever wrote the cover blurb because I do think that the humour and fun that is present in the book is very much reflected in the blurb! 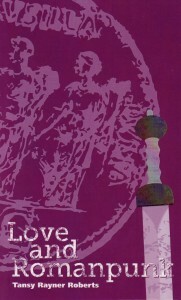 Within Love and Romanpunk, there are four connected stories that take us in time from ancient Rome to the future. The first story is Julia Agrippina's Secret Family Bestiary where the title character tells us all about the strange goings on within the Roman imperial family. Julia was the daughter of Agrippina Major, widow of Tiberius Claudius Nero, wife and niece of Emperor Claudius and mother of Emperor Nero, and she gives us a glimpse into a family filled with paranormal strength (which can be a good and a bad thing) and the special powers that have been bestowed on the Julias. And the creatures - they are legion. Well actually they aren't, but there are a lot of them - from werewolves to lamia, to harpies and dragons, and so much more. The second story is Lamia Victoriana, and is set in the Victorian era. It features two young girls who run off with a debauched poet and his sister. There are elements of forbidden love and passion, and a willingness on the part of the participants as to the type of people the poet and his sister really are. Somewhat fittingly seeing as it is inferred that there is a connection to Mary Wollstonecroft this story is somewhat darker, more gothic in tone than the others that make up the collection. The third story, The Patrician, was my favourite. I loved this story from the relationship between the two main characters to the concept of having a theme town that is built in country Australia called Nova Ostia, built with some of the original bricks from ancient Rome. If you think about historical villages but instead of showing what life would be like in the old west or frontier life the enactment is of Roman life and you would be close to the concept. It is all very well for the tourists who come and visit but for the people who have to live there and appear as authentic as possible it can be a drag. When we meet Clea Majora when she is a teenager who is growing up in Nova Ostia. Her life is changed when she meets Julius. I can't tell you too much more about Julius without spoiling too much but I can probably say that over the years he disappears and reappears in Clea's life, their relationship changing and redesigning itself as Clea gets older, but Julius doesn't! The fourth and final story in the collection is called Last of the Romanpunks and is set further into the future and features as it's main character Clea's grandson Sebastian and a very feisty young waitress. When Sebastian is deceived into attending the launch of a new airship that has been converted into a floating Roman themed taverna, he doesn't realise that for him and for some monsters, it will be a matter of life and death. Whilst these stories could be read as standalone stories, I think it is a collection that begs to be read in order. Not only does the author manage to take us on a journey through time, we also wend our way through subgenres including historical and urban fantasy, with a touch of the gothic, and a little romanpunk as well (if romanpunk isn't already a subgenre it totally should be). I thoroughly enjoyed my foray into Love and Romanpunk and can't wait to read more of the Twelve Planets books, and more from Tansy Rayner Roberts. 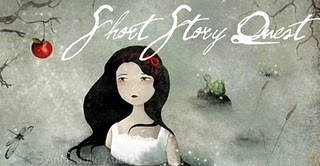 This post is posted as part of the Short Story Quest for the Once Upon a Time V channel, and because I just had to tell you all about this book! This does sound strange, weird and wonderful and like something that I would really like to try out. I hadn't heard anything about this book before, but now you've made me want to check it out and see if I can get my own copy. That last story sounds particularly interesting. Great review on this one!